A map showing the location of each territory controlled by the United States. The United States is marked in blue, inhabited territories are marked in green, and uninhabited territories are marked in orange. A U.S. state is one of the states of the United States of America. Four states (Massachusetts, Pennsylvania, Virginia and Kentucky) use the term commonwealth because they called themselves that when the United States was first formed, but this is only tradition and they are still states. The states are labeled with their U.S. postal abbreviations and capitals. 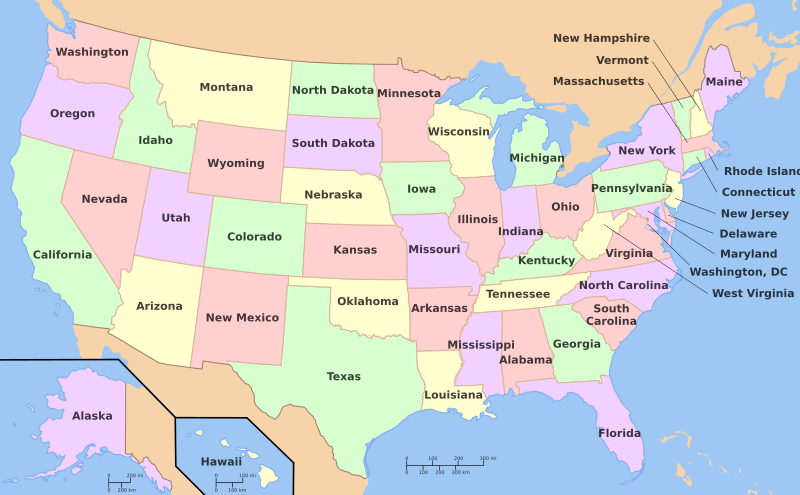 List of U.S. states Facts for Kids. Kiddle Encyclopedia.